This cake received lots of appreciative “ooos and ahhs” from the people I gave it to (plus everyone who has seen it). The cake itself is a basic and quick to make recipe out of a book I was given by my Grandmother, when I was a child. 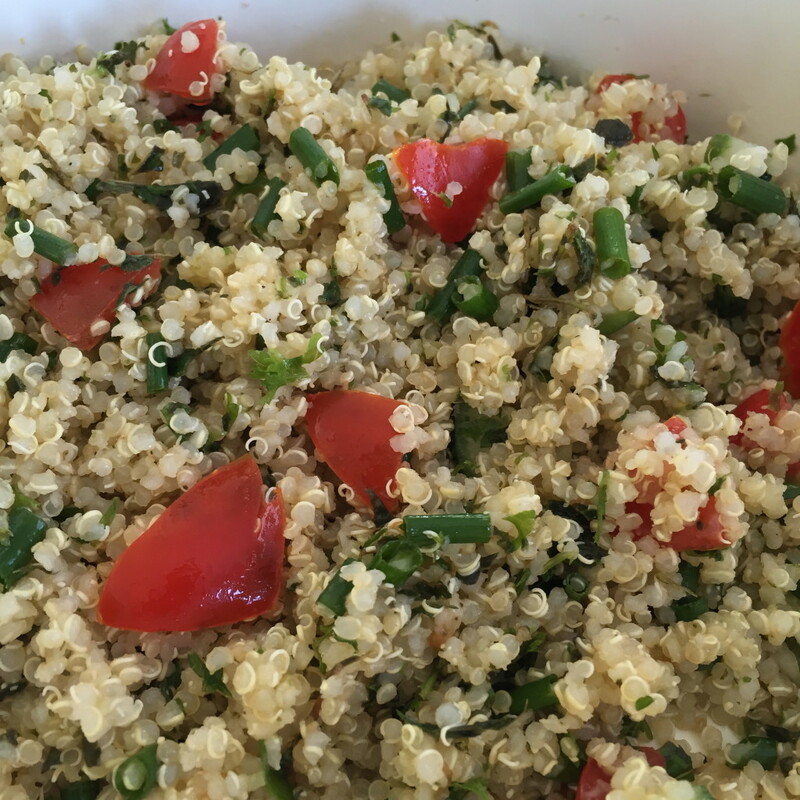 Although the recipe is standard, and you can swap it out with many more decadent recipes, it means a lot to me because of the association with my grandmother, which is why I used it here, (although, being me, I tweaked the original recipe a bit). 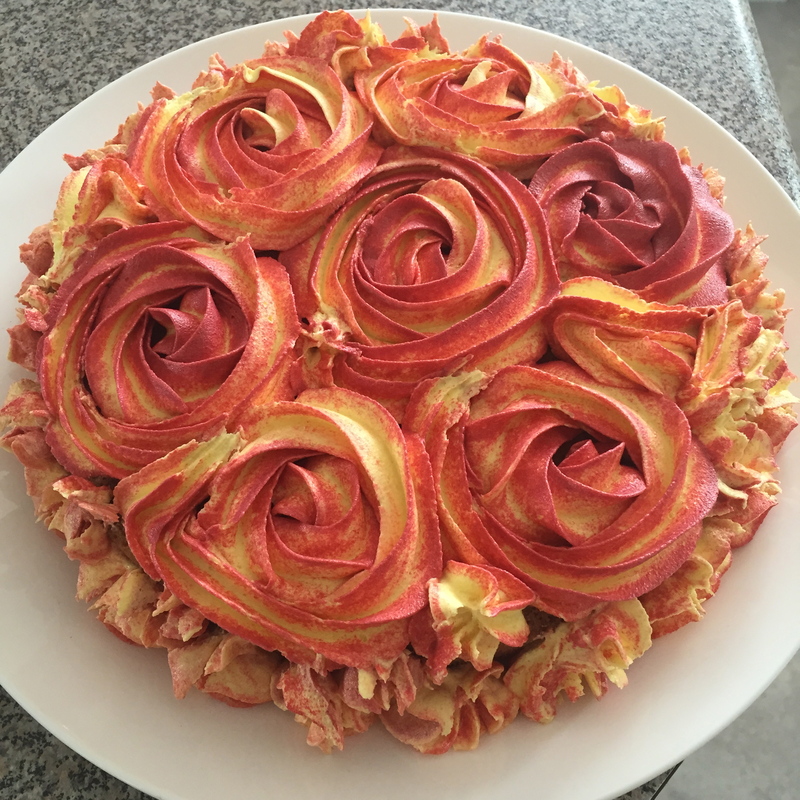 For this recipe I used a round 7” cake tin. 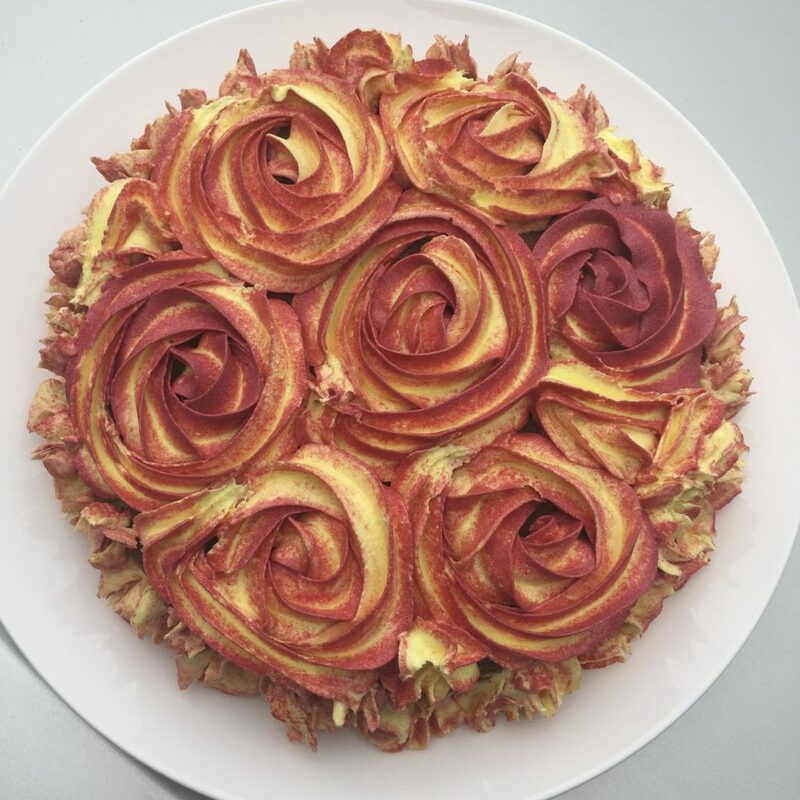 To make the rosette decoration, use a Wilton 1M piping tip. Beat the butter, either by hand or in a mixer, then gradually add the sugar. Beat until mixture is a pale yellow colour. Break the eggs into a separate bowl and whisk together. Gradually add the beaten egg to the creamed mixture, in small amounts, beating well after each addition. Adding the eggs in gradually avoids the mixture curdling. It the mixture does curdle, add in a tablespoon of flour. Add in the cocoa (combined with the hot water), and mix until combined. Add in the flour and fold the mixture together, by hand. Pour mixture into the tin and bake at 180 degrees Celsius for 25-30 minutes. Allow the cooked cake to cool on a wire rack. Mix all ingredients together to form a smooth icing. Divide out a small portion of icing and put aside (this is for the maroon colour). To the larger amount of icing, add the yellow food colouring and mix well. To the smaller amount of icing, add the maroon food colouring and mix well. Into the icing bag, add the maroon coloured icing so that it sits in about 5 stripes inside the bag, going from the top of the bag down to the tip. Then carefully add in the main colour, (the yellow icing), so that it doesn’t disrupt the maroon stripes. Push a bit of icing out of the bag until you get the blended effect, and then ice the cake. This is my absolute all-time-favourite vegetarian recipe, which I have made many many times, (and even make these patties as part of my Christmas dinner to go with roast vegetables.) Many people see tofu as either a bland food that doesn’t appeal at all, or they don’t know what to do with it, but this recipe solves those little problems and turns a chunk of tofu into a tasty meal. I like to keep left-over tofu patties in the fridge to snack on because they are also extremely moreish when cold, and they make a very fine filling for sandwiches with lettuce and mayonnaise. Use nutritional yeast (also known as Brewers’ yeast), not the yeast used for baking. Instead of using sherry in the recipe, you can replace it with lemon juice and water. To keep the ingredients bound together, chop the onions and garlic very finely, and give the sunflower seeds a bit of a chop too, so they are at least chopped in half. Instead of making the mixture into flat pattie / burger shapes, try rolling the mixture into balls to use as a replacement for meatballs. 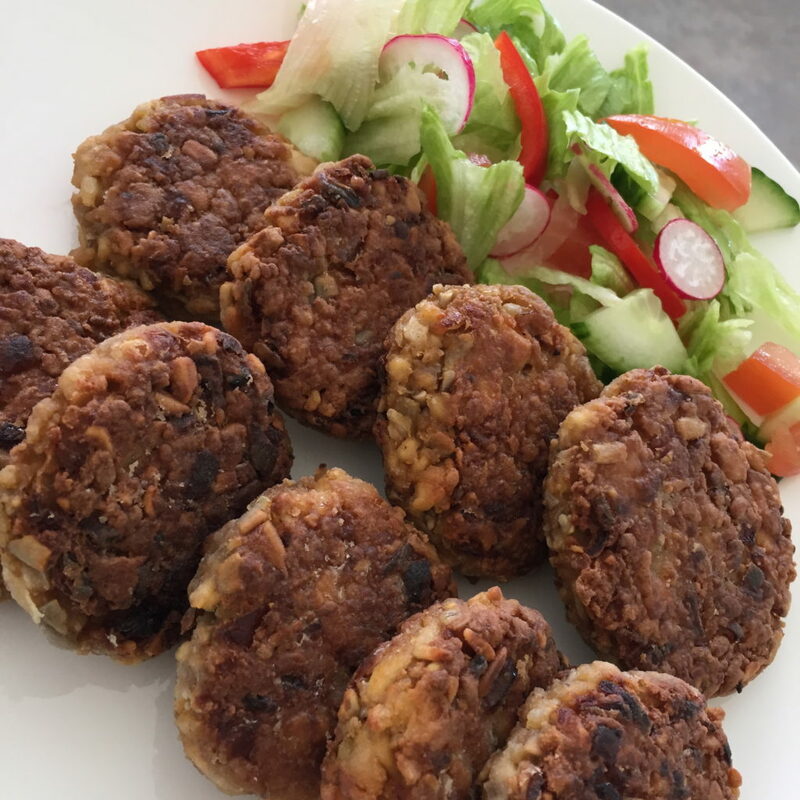 These patties make a tasty filling for burgers/sandwiches with lettuce and other vegetables. Leftover patties can be frozen. Vegetarian | Makes about 10-12 patties. Wash the tofu, then drain and pat dry with a paper towel. Crumble the tofu into a bowl – make sure there are no large pieces. Dice the onion and garlic very finely, and add to the crumbled tofu. Add the remaining ingredients (except the flour), and mix together. Sprinkle the flour over the mixture (to distribute it evenly), and mix all ingredients together well. Working with wet hands, shape a portion of the mixture into an approximately 7cm pattie. Flour both sides of the pattie, then fry for 5 minutes per side or until golden brown. 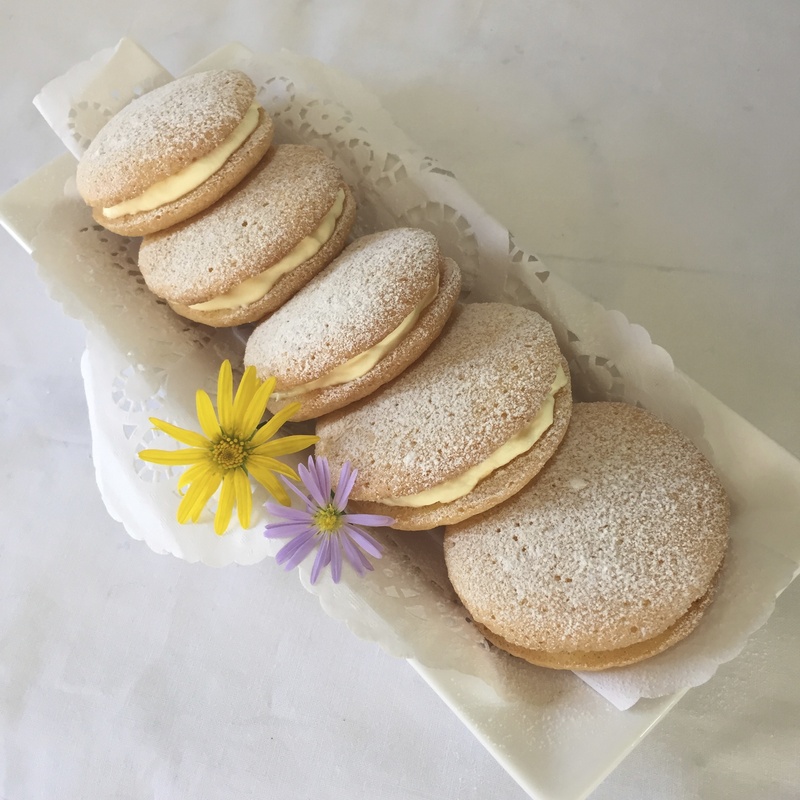 Good old-fashioned sponge drops – they are quick to make, have few ingredients and are a great addition to a high tea. 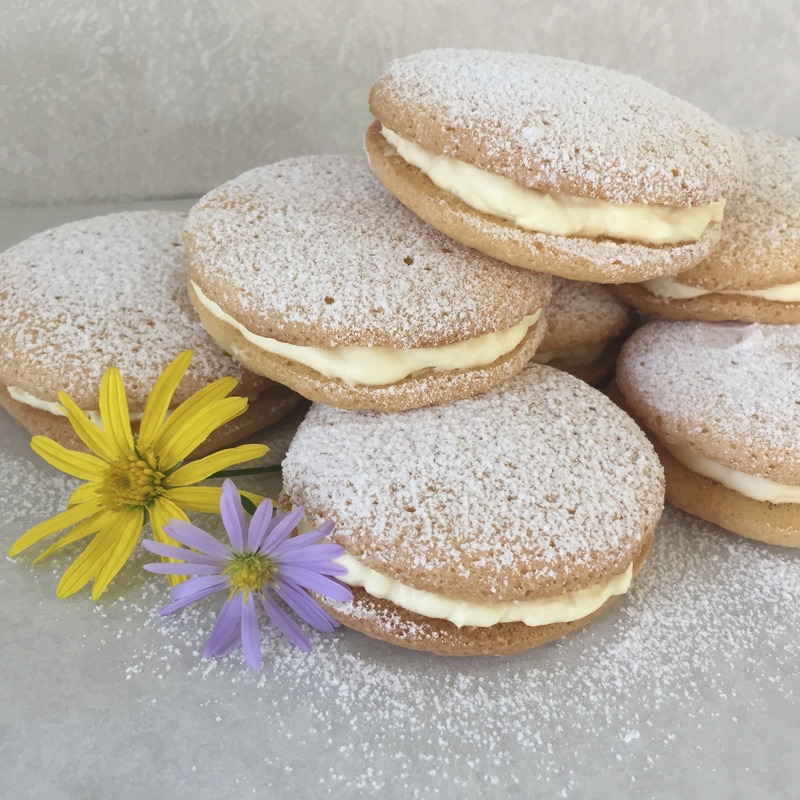 When they come out of the oven, the sponge drops are slightly crisp, but they lose the crispness when sandwiched together with whipped cream, so sandwich them together several hours before serving, so they soften up to a lovely spongy consistency. Beat the eggs, then add sugar gradually and beat until the mixture becomes very thick and pale. Double sift the flour and baking powder, so the baking powder mixes thoroughly and evenly. Fold flour into the egg mix, very gently, and folding in air as you go. Line a cold baking tray with baking paper (or grease a tray), and drop the mixture onto the tray (about a dessertspoonful – you can get 12 drops on a baking tray, if the drops are about 5cm in diameter). Bake for 8-10 minutes at 190 degrees Celsius; watch the drops in the last few minutes of cooking to make sure they don’t brown. Sandwich sponge drops together with whipped cream several hours before serving to allow them to soften. Dust with icing sugar before serving. * Or make up a packet of raspberry jelly to packet instructions. Set the jelly in wet patty tins, covering the base with only a thin layer of jelly (about 3-4 mm). When set, turn them out and place in the middle of the sponge drop on top of the cream. 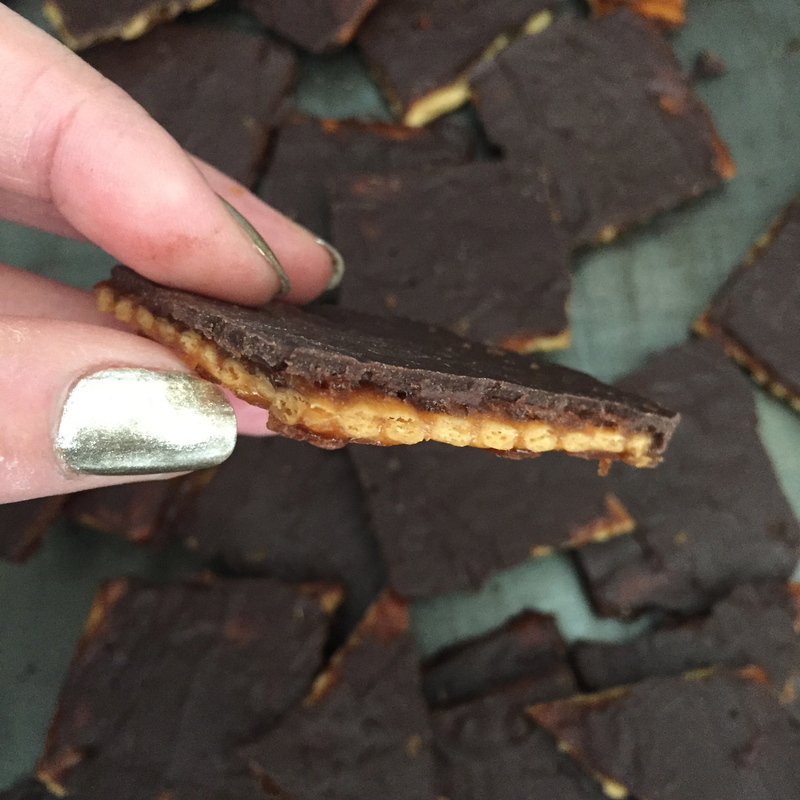 Broken up Salted Caramel Salada Crackers in squares and triangles. 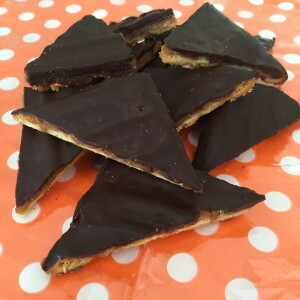 Cross-section of the crackers – the caramel melts between the perforations and holes of the Salada cracker during cooking, and caramelizes on the base. 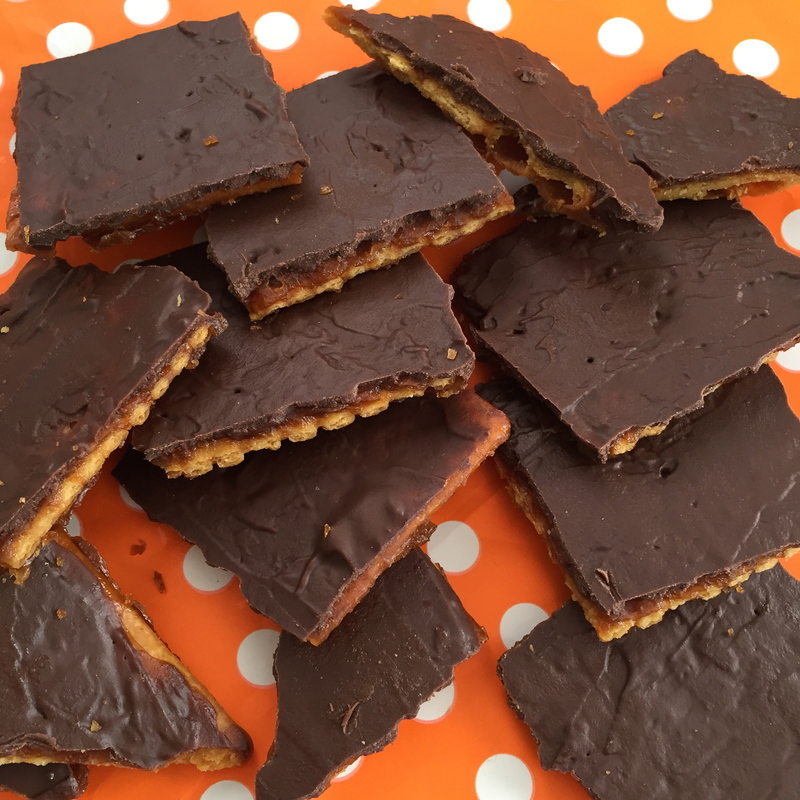 Salada crackers are ideal for this recipe as they are plain, large, pre-salted crackers that have indentations so they break into 4 even pieces. During my rigorous and ‘scientific’ testing, to determine the perfect chocolate for the topping, (which consequently involved consuming many of these biscuits), I discovered that chocolate chips are the winner, because they are convenient to sprinkle on and the chocolate sets nicely too. You can also use chocolate melts or buttons, but avoid soft chocolate, such as 70%, as it is too soft and won’t set properly enough for the topping. These chocolate and caramel coated crackers are great to make as gifts. Line an expandable sponge roll/slice tin with baking paper and place a single layer of Salada crackers in the base of the tin. Close the expandable tin up so it is as close to the sides of the biscuits as possible. In a saucepan, heat butter and sugar and boil for 3 minutes, until it is a nice caramel colour. Pour over crackers, and spread in an even layer, not too thick (you don’t want the caramel too thick or it makes the biscuits hard to eat because the caramel sets as a hard toffee, consequently, you may not need to use all the caramel if you think the caramel layer is thick enough to coat the biscuits to just give them a nice ‘snap’ when they are broken up and bitten into). Bake at 180 degrees Celsius for 10-12 minutes. The caramel will bubble, and make sure to watch it in the final few minutes to make sure it doesn’t start to turn brown. Sprinkle chocolate chips over crackers as soon as pan comes out of the oven. Allow to stand for a few moments and then spread chocolate evenly with a spatula over the pan. Let cool and harden. Break cooled biscuits up into random pieces, or if you want even pieces, snap into squares using the pre-formed break marks in the Salada cracker. You can also break them smaller – into triangles – by scoring the backs of the squares with a knife, from corner to corner, then snap into triangles. Keep biscuits in a sealed container at room temperature or, for extra crispiness and snap, store them in the fridge.